Chances are the business card you hand out is that of your employer. It’s got your name, title, company logo and address on it, but does it really say who you are? The stuff you blog about, your professional tweets, where are they? Do you hand out another card with your personal details on it. 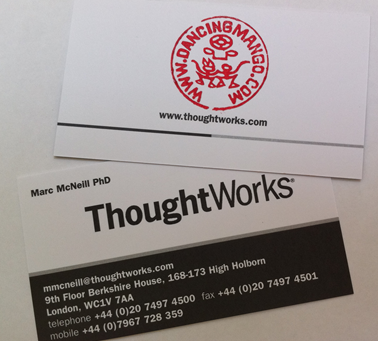 Whilst at Leancamp, Nicky Smyth handed me her (BBC) business card. Alongside her BBC details, she’d used an ink-stamp to provide her personal URL and twitter account. I’ve not got round to getting a stamp created, but when we were blogging round the world, in Lijang, China I had a stamp made up with Dongba script, pictographics from the Naxi people and the dancingmango URL surrounding them. I’ve been using this to pimp the back of my ThoughtWorks business card. In the India office, we get to mention our blog url officially. It is part of the ‘request business card’ form template. Gets printed on the bottom right. This is cool. It is a touch that makes your card somehow more special – the feeling that not everyone gets the personal touch. How about adding a QR code on the back of your card?